"Free People" Photo by Hossam al-Hamalawy, Jan. 30. 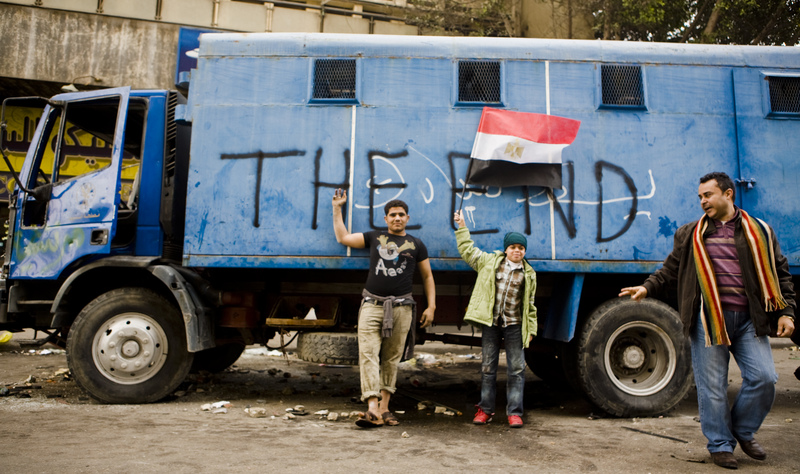 The first–or one of the first, who knows?–studies of the art of the Tahrir uprisings has been published. It’s called Signs of the Times: the Popular Literature of Tahrir Protest Signs, Graffiti, and Street Art and was “curated” by Rayya El Zein and Alex Ortiz. Published April 1, 2011, it’s an issue of Shahadat–a visual magazine published by Art ə East, a Middle Eastern art web site. This issue takes as its focus the popular literature of the Egyptian Revolution. Drawing on protest signs, graffiti, and street art in Tahrir to read the culture of resistance particular to the Egyptian Revolution, the curators examine how protesters changed the political narrative through the use of images, memorials, and expressions of daily life. Featuring examples from an extensive gallery of online images culled from the collections of several prominent Egyptian journalists and activists, the online piece is a visual tour of some of the creative production of Egypt’s Revolution. A collaborative curation project split between New York City and Cairo, this is ArteEast’s first critical look at the cultural production related to recent political developments in the Middle East. The text consists of 40 images and several short essays. The images are drawn from the online galleries of seven photographers — Kodak Agfa (a name used by Zeinab El-Gindy), Jehan Agha, Sarah Carr, Jano Charbel, Hossam el-Hamalawy, Gilad Lotan, and Ramy Raoof — whose work has been widely circulated and archived on Flickr as well as the artists/activists own blogs. The essays are excellent–short, evocative and insightful. 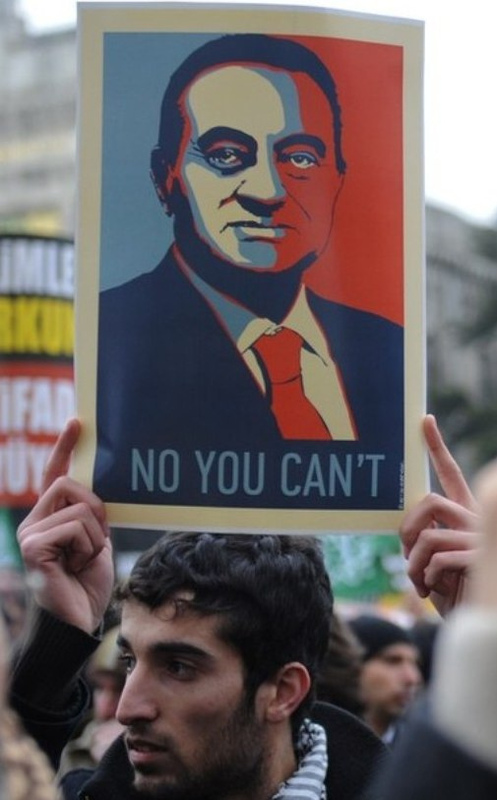 Each considers the protest images at once as popular literature and visual culture, and explores implications for political and aesthetic understanding. Assessing the framework of how the revolution was watched becomes more grounded when we consider that both Mubarak and protesters seem to have been keenly aware of the potent politics of being seen. The regimes constant and brutal crackdown on journalists and their equipment reflect an anxiety about the infectious power of specifically seeing resistance. 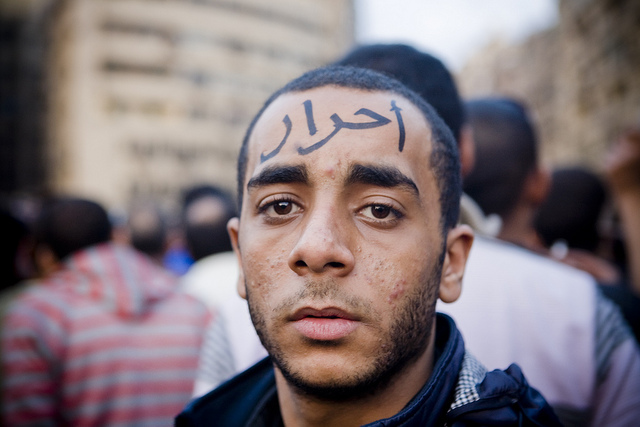 And Tahrir protesters were consistently aware of the potential dangers of being seen or remaining hidden. The second essay, by Alex Ortiz in Cairo, focuses on the challenge of translation–the loss of the poetic rhythms and internal rhymes that make many of the signs and grafitti especially funny, witty or powerful. Other essays focus on the sheer quantity of images and what that says about the revolution as well as the challenges it poses for curators selecting a few for an on-line magazine, the power of the mundane in creating revolutionary realities, the interweaving of words and images in the texts of the protest, and the place of Arabic, English and other languages. A longer (and more thoughtful) review by Anthony Alessandrini, replicating many images from the issue but also adding images and videos related to the themes of the issue, can be found on Jadaliyya. Thanks for this review, Mark! Really appreciate the support. There seems to be some confusion over my co-curator’s name! it should be Alex Ortiz (not Jose Ortega or Alex Ortizan) 😉 Thanks very much! It was a beautiful effort, I hope lots of people see and read it. Sorry about the name error–it’s been corrected. we hope so too! thanks for your help getting the word out!